Thanks to many hours of voluntary work in the evenings by local artist Andrew Kitson the children of Mulbarton now have a view of the seaside in place of the unsightly block wall that creates the barbecue outside the Village Hall and Social Club in the children's play area. 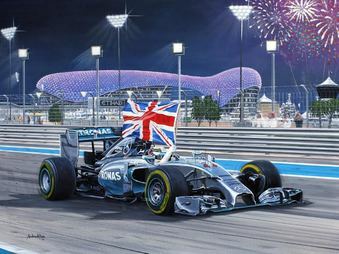 Andrew Kitson is well known for his amazing Formula 1 paintings and also has the accolade of having been Britain's F1 Driver Lewis Hamilton’s Official Artist. "Our village hall and social club in Mulbarton has a children's play area alongside the adjoining social club. For years it has had an unloved breeze block brick BBQ, used quite often in the summer but an absolute eyesore...so I brightened it up a bit for the kids that use the park." Many thanks Andrew, I hope you've signed the wall !